Morning Glory or Water Spinach is a common leafy vegetable in South East Asia. It is crunchy, juicy and very rich in taste. This simple stir-fry is a popular water spinach recipe with just 4 ingredients and ready in 15 mins. I love the name Morning Glory! 🙂 In SouthEast Asia water spinach is locally known as Kangkong or Ong Choy. In India, water spinach is usually found in North Eastern states where there are plenty rice paddies.We also call it Chinese Spinach! 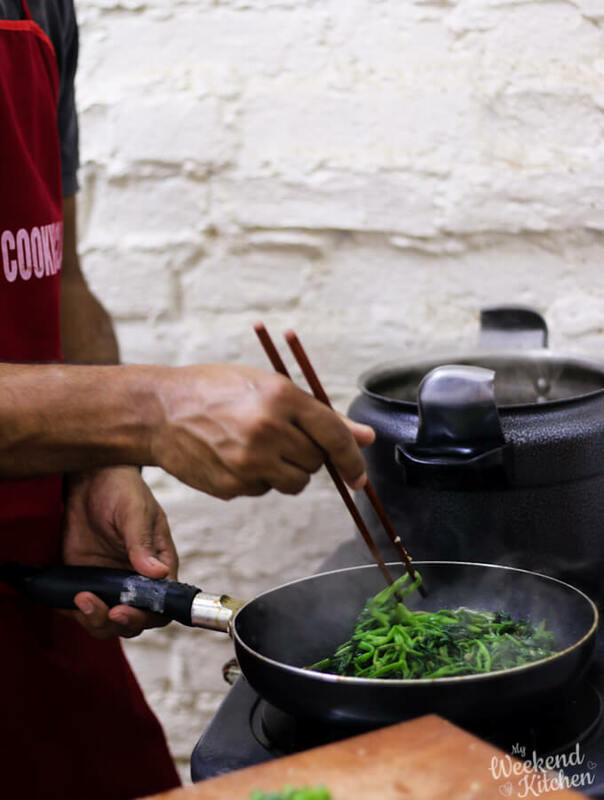 When we started our South-East Asian travels from Vietnam, on our second day itself we took a cooking class to learn some of the traditional Vietnamese dishes and also to get an idea of the street foods and the dishes we shouldn’t miss. Our cooking instructor, Nga, ran a cooking school along with her friend. She picked us up from our apartment in the morning and first took us for a traditional Vietnamese breakfast over which we talked about our food restrictions and preference. Our only constraint was the food should be plant-based and vegan. We had initially thought it might be a problem as for us their food was largely based on seafood or meat. But we couldn’t be more wrong! Vietnamese has so many fresh vegetables and herbs, that we were pleasantly surprised by all the dishes she suggested. The quintessential dish – Pho Soup – was definitely there and then was this morning glory stir fry, vegetable spring rolls, mushroom patties, and fresh rice noodles. 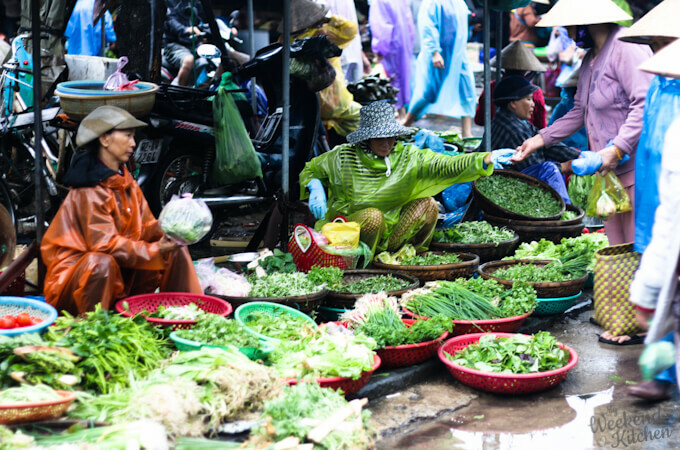 Morning vegetable market in Hanoi! After buying whatever we needed, we headed to her kitchen and started with the chopping and prep along with lots of information on how to go about asking for vegan food during our travel. 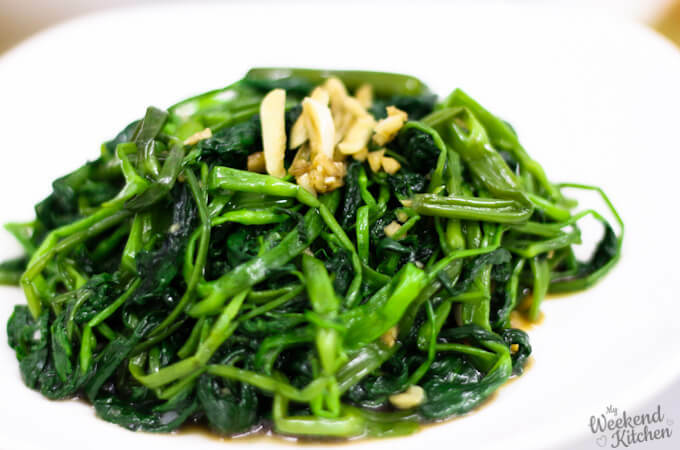 This water spinach stir fry was one of the most popular side dishes we ate during our entire travel. It is a dish that you will find on the streets as well as in fancy restaurants. I guess the popularity also comes from the fact the vegetable grows in so much abundance, is highly nutritious and is so simple to prepare. While it had taken me a few years to perfect the art of eating with chopsticks, in Vietnam, this time I also learned how to cook with them! Cooking with chopsticks! That is me clicking & my husband stirring the morning glory! 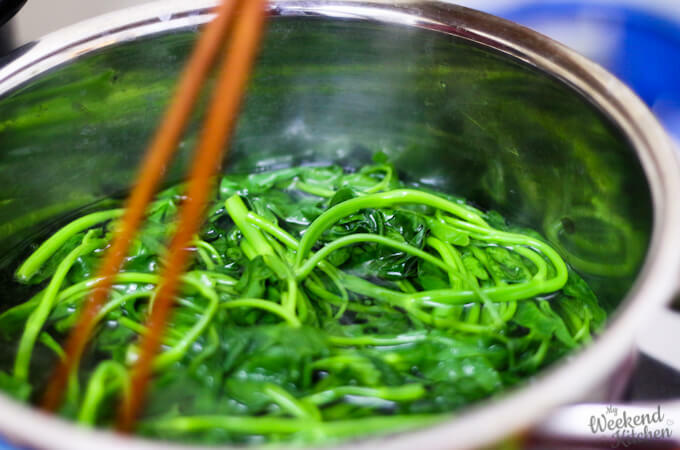 What does Water Spinach taste like? Water spinach has a very unique crunchy and juicy taste. They have a hollow stalk from which the leaves grow. The stem is quite thick, crunchy and juicy from all the water it absorbs. The leaves have a slight salty bitterness just like regular spinach. Since water spinach grows in rice paddy fields, it has a high water and fiber content. Water spinach is also rich in iron, proteins and vitamin A,B and C.
Morning Glory is easy to digest and can be eaten both raw as well as cooked. While cooking, it only needs to be gently cooked for just a few minutes. 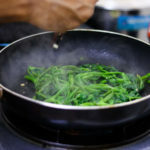 While water spinach can be eaten raw, our cooking instructor told they would always lightly steam or blanch the vegetable if they are not sure of the conditions of the water in which the vegetable grew. We first washed the leaves thoroughly under running water. then stir-fried the water spinach in a little rice bran oil. The leaves are seasoned with burnet garlic, soya sauce, and lime juice. There was no need to add any salt on top as the water spinach leaves themselves are naturally salty and soya sauce also adds salt. Outside of South-East Asia, morning glory vegetable can usually be found in Asian vegetable markets, but the same stir-fry recipe can be used to cook with other greens like spinach, kale, and cabbage. 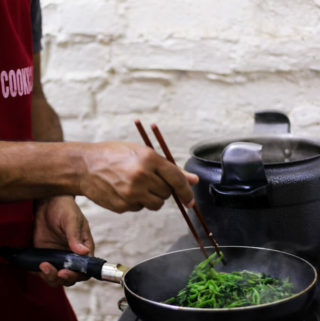 While in this recipe, we only used a little garlic, soya sauce, and lime juice for seasoning; you can more vegetables to the mix like this mushroom and spinach stir fry recipe. Morning glory, also known as water spinach is a common SouthEast Asian vegetable. This simple stir-fry is a popular water spinach recipe with just 5 ingredients and ready in 10 mins. Wash the morning glory under running water until it runs clear. Cut the roots if required. Blanch the morning glory in boiling water for just about a minute. We don’t want the greens to lose their crunchiness or bright color. Immediately drain and run under cold water to stop the cooking process. Heat oil in a wok or a shallow pan. Add the smashed garlic cloves and sauté till they just start to turn brown. Add the blanched water spinach, soya sauce, and lime juice. Mix well such that the vegetable is coated with the sauce. Cook for about a couple of minutes. It doesn’t take long for morning glory to get to that fine texture of tender-crisp. Remove from wok into the serving plate immediately. While I prefer to keep it simple, you can more vegetables like shallots, onions, ginger, chilies, and/or mushrooms in the recipe. Soya sauce usually has gluten in it. Check for gluten-free on the label if sensitive. If you need to avoid soya sauce, season it with just a little salt and pepper. Nutrition Information is an approximate value for 1 of 4 servings. 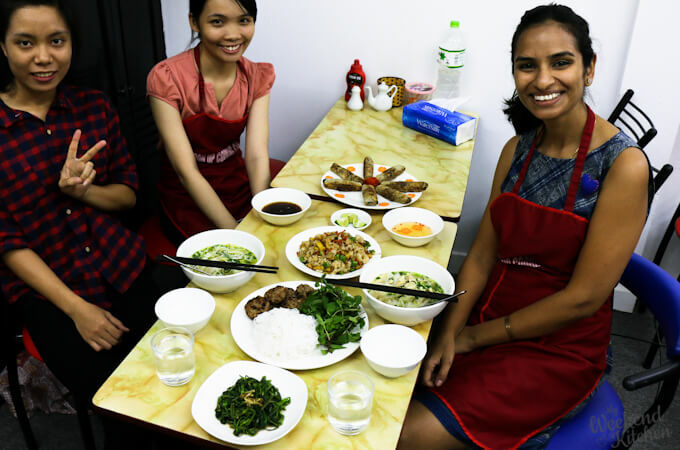 Nga and her friend at Apron Up Cooking Classes in Hanoi really added to our food experience in Vietnam! And they were so kind to change their dishes to suit our plant based diet restrictions! Would really recommend them to anyone who is looking for an authentic experience in Hanoi! 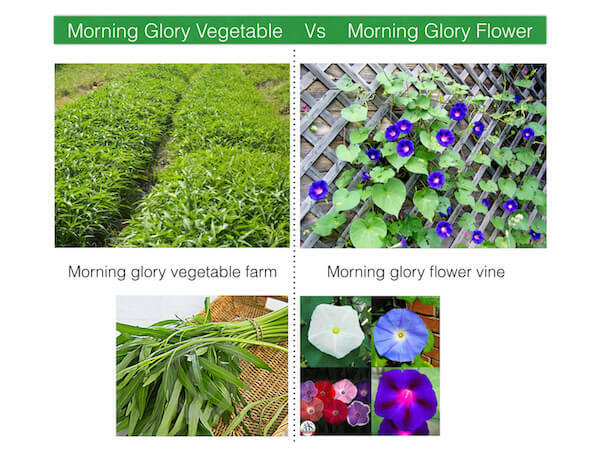 Morning Glory vegetable grows in farms with lots of water. It has long thin stems with arrow shaped leaves. Morning Glory Flower is a climber with heart-shaped leaves. The flowers open up first thing in the morning, hence the name. Morning glory flowers and seeds are not edible. 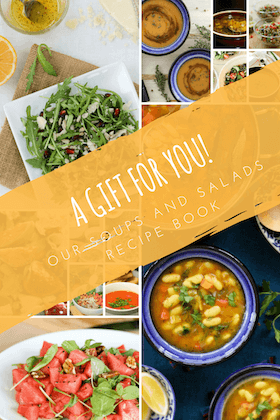 « Zucchini wrapped Spanakopita – gluten-free & flourless!